As effective as they are, traditional dental implants may not be a possibility for some patients -- especially if the teeth have gone without replacement for an extended period of time. If you are missing all of your teeth in the upper or lower jaw, if you have been told you are not a good candidate for traditional dental implants, or if you are on the brink of total tooth loss, it is time for you to learn about All-on-4 dental implants in Florham Park. Dr. John A. Carollo provides this option, also known as Teeth In a Day, to help eligible patients enjoy all the benefits of a long-lasting, comprehensive tooth replacement. Many adults are missing teeth. In fact, the majority of Americans over the age of 35 have lost at least one tooth -- and almost 28 percent of people over the age of 65 are missing all of their teeth. If total tooth loss has happened to you, you may have thought that seeking a traditional denture was a sufficient solution. Dentures look more or less natural and function well enough, after all. But if you are like most of our patients, you will soon find your dentures slipping around when they shouldn’t, or that you just can’t eat everything you like without your natural teeth. But we encourage you not to give up! It’s definitely not too late to enjoy the benefits of a complete, natural-looking smile that functions just like it should. 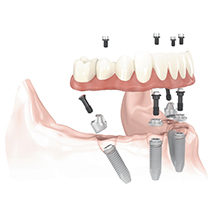 After total tooth loss, All-on-4 dental implants from Dr. Carollo provide a wonderful solution. To understand just how All-on-4 dental implants work, it is important to know something about traditional dental implants. Tiny titanium posts inserted below the gum line, they are a comprehensive tooth replacement that gives you back the missing crown, or the visible portion that helps you chew and speak, as well as its supportive root. When cared for properly, dental implants can be expected to last for a lifetime. Non-implant supported dentures or fixed bridges will require replacement or refitting as time passes and the jawbone gradually diminishes. By replacing the supportive root structure, dental implants provide the most natural-looking and properly-functioning tooth replacement available today. Bone tissue needs stimulation and plenty of blood flow to thrive, and after the loss of the natural teeth’s roots, the dental implants provide this activity for the jawbone. Patients who have had their teeth replaced with dental implants are likely to retain their youthful appearance -- non-implant retained denture wearers, on the other hand, are sure to experience the aged, sunken look we often associate with tooth loss. Without a properly-fitting tooth replacement, patients are also more likely to suffer from painful oral sores. Aside from being uncomfortable, these persistent sore spots are linked to infection and oral cancer. And meanwhile, sufferers of ill-fitting dentures have to deal with the stress and potential embarrassment of a prosthetic that moves around or falls out at inopportune moments. How Is All-on-4 Different from Traditional Implants? 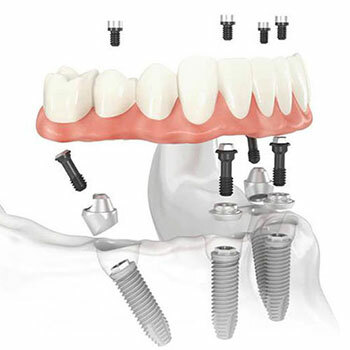 All-on-4 dental implants offer a faster route to dental implants than is possible with the traditional method. The solution is only possible for fully edentulous patients, or those who have lost all of their teeth. All-on-4 dental implants are also known as Teeth In a Day for their ability to be restored very soon after placement, usually within 24 hours of the initial procedure. Compare that time-to-teeth to traditional dental implants -- which can leave patients waiting for up to a year -- and it’s clear that one of the most significant differences between the two are in total treatment time. Thanks to their strategic placement, All-on-4 dental implants can also eliminate the need for the preparatory procedures that are often necessary before traditional implant dentistry. That means All-on-4 can be a much faster and less invasive procedure overall. If you are wondering whether or not Teeth In a Day may be a wonderful option for your teeth, we invite you to get in touch with Dr. Carollo’s office to schedule an initial consultation today. No matter the cause of your tooth loss, most adults who are in reasonable oral and overall health (i.e. healthy enough to undergo and recover from a surgical procedure) who have already lost or are about to lose all the teeth in the upper or lower jaw are eligible for the All-on-4 dental implant method. However, smokers should be aware that tobacco use greatly diminishes the success of their dental implants. Smoking inhibits healing and makes it difficult for your jawbone to grow together with the dental implants. You may be advised against All-on-4 if you cannot give up smoking. If you are ready to quit smoking but are unsure how to go about it, talk to your doctor about successful smoking cessation tactics. Wondering what you can expect from the All-on-4 dental implant procedure? Yes, they are called Teeth In a Day, but the entire process is actually carried out over the course of a few appointments. You can expect your new implant-retained dentures to be in your mouth and functioning with unsurpassed stability after a couple of weeks. First, we will schedule an initial consultation between you and Dr. Carollo. During this appointment, our team will take a three-dimensional scan of your mouth, and you and Dr. Carollo will fully discuss your oral health as well as your smile goals. What are you looking for with your tooth replacement? Are dental implants worth the investment for you? After we have determined that All-on-4 is the best option for your smile, we will move forward with the treatment. Impressions or molds of your upper and lower jaw will be made so that we can create your personalized treatment plan. All-on-4 dental implants require extreme precision, so the planning phase is crucial to the ultimate success of your new tooth replacement. With these molds, our technicians create the new, lifelike prosthetic (the denture) that will be affixed to your All-on-4 implants. On the day of the procedure for your All-on-4 dental implants, our staff will welcome you warmly into Dr. Carollo’s office and answer any questions you may have about the treatment. Then, we will administer local anesthesia and sedation, as desired. Once we are sure you are completely comfortable and relaxed, the procedure can begin. Dr. Carollo begins by removing the remaining teeth (if any still exist in the gum line) and cleaning out any diseased or infected tissue. 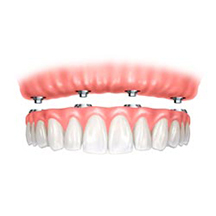 Then, two dental implants are placed at the front of the jaw, where there is maximum support. Two more dental implants are inserted at a 45 degree angle along the side of the jaw to draw as much strength from the sturdy bone as possible. Thanks to this strategic approach, your All-on-4 dental implants can be restored soon after placement -- in as little as 24 hours, you can be smiling once again with a new, beautiful denture! After he has restored your smile with your new teeth, Dr. Carollo will send you home with important after-care instructions to help you speed through healing as comfortably and quickly as possible. That includes keeping up with your good dental hygiene (brushing and flossing), and maintaining a diet of soft, nutritious foods until you feel comfortable eating normally again. Do not engage in strenuous activity, and definitely avoid putting your face at risk of trauma (like playing contact sports). Take any pain medications or antibiotics as directed by your doctor, and attend follow-up appointments as recommended to ensure you are progressing through the healing phase as you should. Discomfort and swelling don’t always occur, but if they do, symptoms should start to subside within a few days following your All-on-4 procedure. If not, contact Dr. Carollo’s office soon. Schedule an Appointment for All-on-4 in Florham Park! If you have already lost or are on the brink of losing all of your teeth, do not delay in finding a comprehensive tooth replacement. All-on-4 dental implants or Teeth In a Day come as close to replacing your natural teeth as currently possible, and chances are excellent that you are a good candidate for the procedure. We can’t wait to get started on your new smile! Contact us to schedule an appointment with Dr. Carollo today.